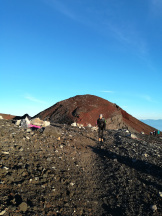 During my internship, I could not miss the opportunity to climb one of the world’s most famous mountains in Mount Fuji. 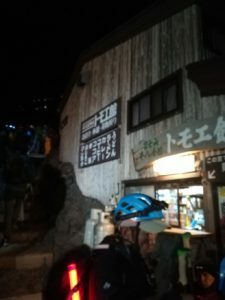 Not knowing any specific information about the climb, I was surprised to learn that most climbers choose to take a bus up to the fifth of the mountain’s ten stations to cut the hike short. 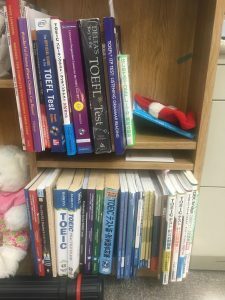 I also learned that a previous intern had succeeded in making the hike from the bottom of the mountain which inspired my sense of adventure to take on the challenge. Upon emailing said intern, I was further intrigued, and a little intimidated, by the details she provided me. She described that overnight hike as an increasingly steepening 12 hour trek to the top to see the rising sun. She also pointed out the massive temperature changes, saying that at the base she was sweating in shorts while at the top she was cold under 2 layers. 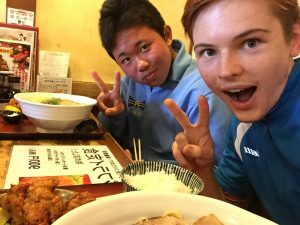 After hearing this account, I was motivated to take on that hike and saw it as a tremendous personal challenge and truly unique Japanese experience. 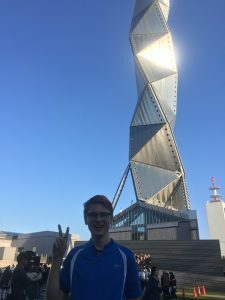 So, I took a train to Tokyo on a Friday evening in late July and then transferred to a bus that took me to Kawaguchiko, one of the towns at the mountain’s base. 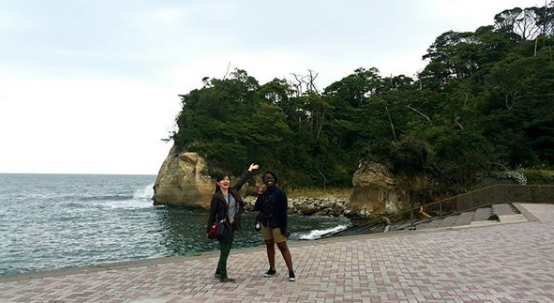 That evening I stayed in a capsule hotel, and the next day I stopped by an onsen to relax before I began the hike. 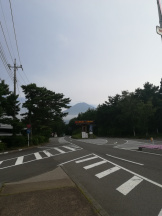 I then began hiking from the onsen at around 4:30. I followed a main road and eventually another road, reaching the start of the trail within about an hour. During this time, the sun had began to set and twilight descended. It was near fully dark at around 7, during which time I was guided only by my headlamp in the woods for about 2 and a half hours. It was a somewhat eerie yet peaceful experience I can’t say I’ve experienced an equivalent to. Eventually, the forest cleared and I stopped at a station featuring an overlook and a shop selling snacks. There, I bought a chocolate bar which is one of the best things I have ever eaten given how tired I was. At that point I was beginning to worry that it may be difficult to complete the hike. However, I was determined to see my goal through, reminding myself to continue to pace the hike. While the forest part of the path featured many steps, the next part became significantly steeper and was coated in gravel, making progress much slower. This was especially disheartening after I realized how tired I already was at that point. 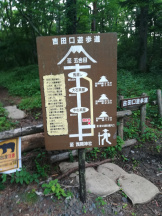 After reaching the next station, I was surprised to see signs indicating that the top of the mountain was only 5 km away. As a high school cross country runner, I had to walk many 5ks on pre race course tours, which generally took only 45 minutes to complete. Knowing that I wasn’t supposed to arrive for 6 hours, I was worried about what lie ahead. At this point, the area was lit up by fellow hikers and their headlamps. The whole trail was covered in hikers and the path to the top was completely illuminated. However, at this point the trail wasn’t so congested; it was possible to hike around slower walkers. This would change; if memory serves it took me over an hour to cover the final kilometer. The trail became extremely congested to the point where I spent long periods of time just standing still in line. My arrival was worth it. I received a major sense of accomplishment upon the completion of the hike. 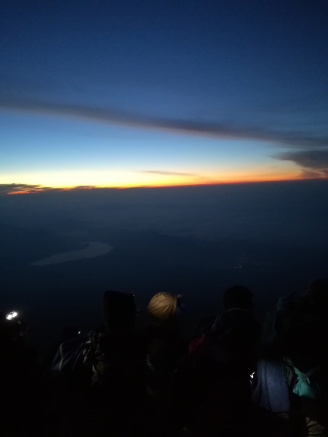 While the sunrise was partially covered by clouds, the view was still spectacular and my tiredness made it all the more satisfying. In addition to the view, the top of Mount Fuji itself is a spectacle to see. Hiking trails circumvent the volcano’s crater and the ground is covered in very distinctive red volcanic dust. It also features a Ramen shop, which after completing my hike, proved to be some of the best Ramen I had in Japan. 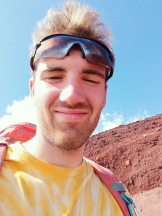 I am very happy that I went through with this hike as it has proved to be one of my proudest accomplishments. If any readers ultimately end up interning at ICU and would like more information about the hike, please do not hesitate to reach out to me at matt.curry56@gmail.com. Having lived in Hitachi for two sumers now in an apartment, it’s easy for me to say that it is extremely convenient and enjoyable to live by oneself in Japan. 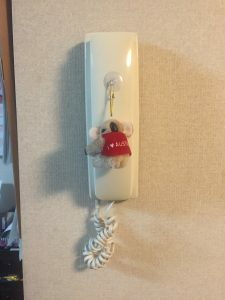 I stayed in Sagawa-san’s apartments, other known as the “Maison d’Espoir” complex. Sagawa-san is the landlord, and he is very friendly and helpful. On your first day in the apartment, he will guide you through everything that you need to know, including when/how to throw out the trash, where to put recyclable PET bottles, how to use the stove, etc. The apartment itself is quite small, being that it is a studio. 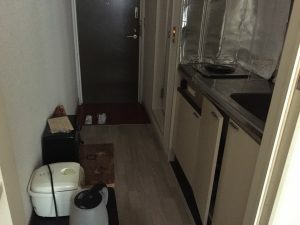 The kitchen has a singular stove, but Sagawa-san provides an abundance of cooking supplies and eating utensils such as pots, pans, plates, bowls, and cutlery. The bathroom has a classic Japanese-style shower/bathtub/sink combination, which saves a lot of space and is easy to use. There is air conditioning, and depending on the room, there may also be a fan. There are hangers for clothes drying, a vacuum cleaner, and a closet as well as other storage cubicles. There is also a TV (beware of NHK! Sagawa-san will explain this when you meet him). 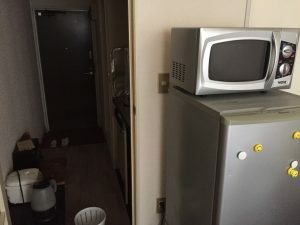 Additionally, Sagawa-san provides a fridge, microwave, toaster, water kettle, and a rice cooker! During my two stays, I had the chance to see three different apartments. I can safely say that the layout for the apartments I stayed in varied only slightly. For example, in 2017, I had a desk and chair, and this year in 2018, the two apartments I saw had floor tables and no chairs. *I had to change my apartment once this year because my AC had broken down, and Sagawa-san swiftly helped me move into a different apartment the very next day. Both the apartments I stayed in this year were on the second floor, whereas the one I stayed in last year was on the first floor. 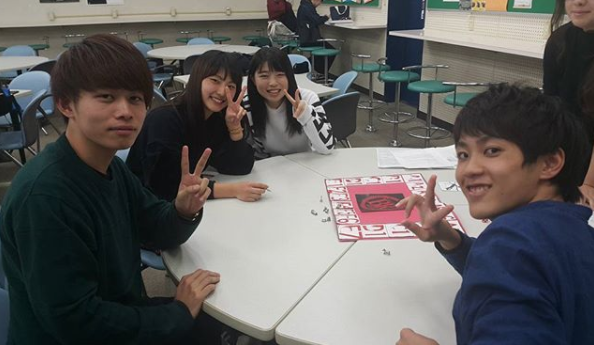 If you have a request to have a table or floor table, I would make sure to let the Intern Coordinator and Sagawa-san know before it is arranged! 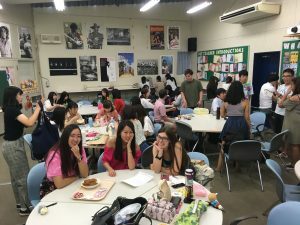 I personally would have preferred having a chair this year, but it was nice to experience using a floor table and a seat mat (that I purchased at Daiso) seeing that I was in Japan! As for beds, my first and second apartments had regular beds and Sagawa-san provided all of the bedding. The third apartment had a sofa bed, which was slightly less firm than a mattress, but still very comfortable. 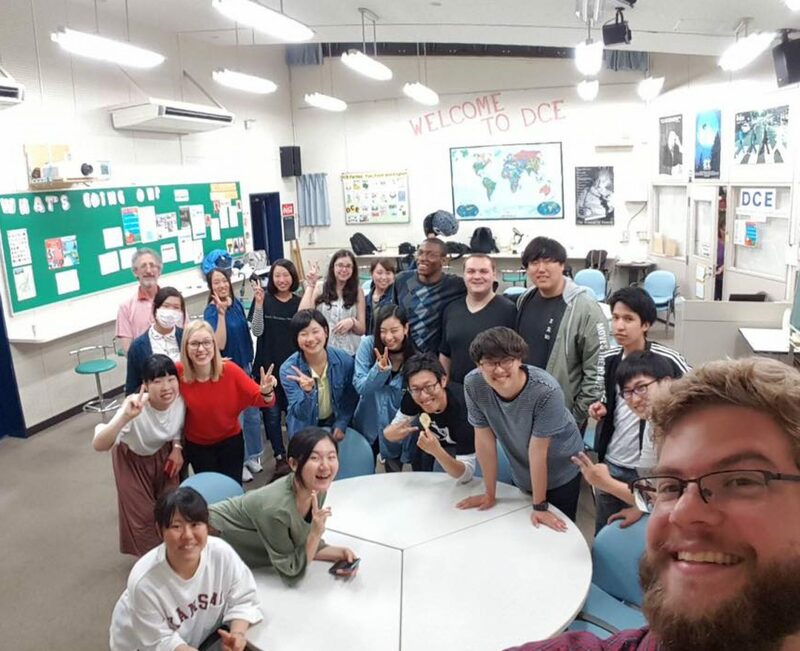 The apartment is conveniently located about 25 minutes by foot from Ibaraki Christian University or 12 minutes by bicycle. A 5-minute walk away is a Daiso (100-yen shop) as well as a Mini-Stop (convenience store). I have found these two stores to be extremely useful. Daiso for things such as dish sponges, cups, and just about anything you will need in your apartment (even soy sauce, spices, and food!). Mini-stop is a 24/7 convenience store that will satisfy your late-night cravings or if you need anything when stores are usually closed. About a 20 minute walk away in two different directions are two supermarkets: Maruto and Sanyu. Maruto is larger, closer to the school, and slightly cheaper overall. I wouldsuggest shopping at Maruto. Sanyu is smaller but adjacent to a drugstore (drugstores in Japan also sell toiletries and amenities such as shampoo, make-up, soap, etc.). If you prefer the independence and freedom, I would highly recommend staying in the apartments. If you like to cook, the singular stove is easy to work with (you can get creative with how to cook everything!). 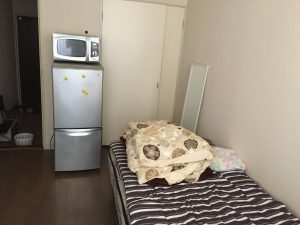 I have nothing but good impressions of the apartments and can say that if I were to return (a third time…) to Hitachi, that I would definitely return to the apartments. With Tokyo only 2 hours away, it would be a shame to not venture into the city during the weekend. 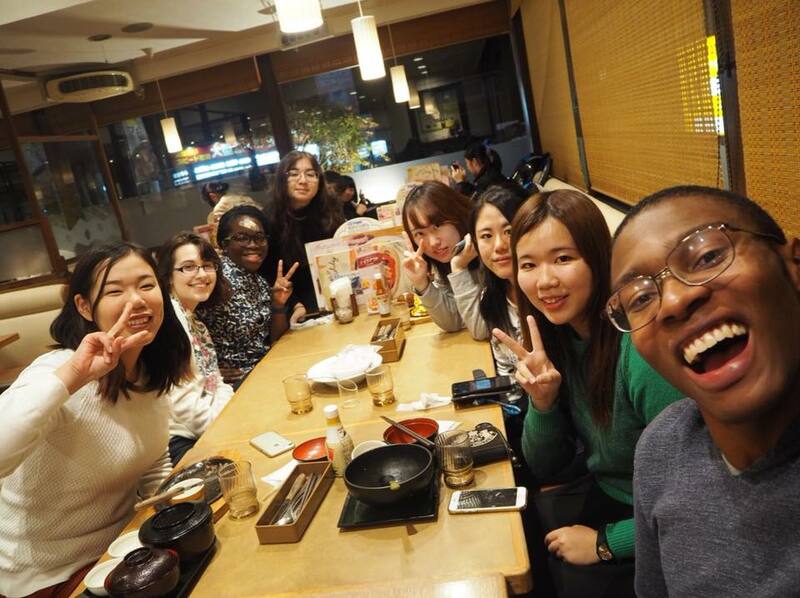 Lucky for interns, it is very easy and cheap to take the highway bus to and from Tokyo! Ibaraki and Tokyo should be in the “to” and “from” sections. 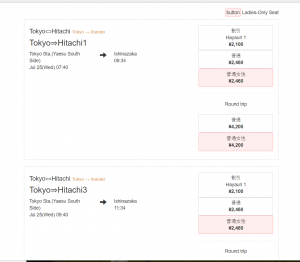 The route should be “Tokyo –> Hitachi”. The bus stop for Tokyo should always be Tokyo Station. There are two choices for the bus stop from Ibaraki. 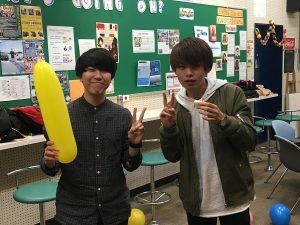 “Shintanakochi” is the stop interns use when they arrive from the airport but without a car it is a little difficult to get to. 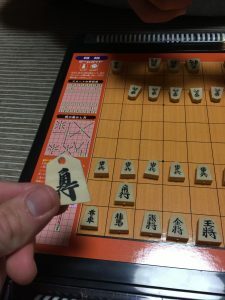 I suggest using “Ishinazaka”. This stop is just up the road from IC and can be easily walked to. 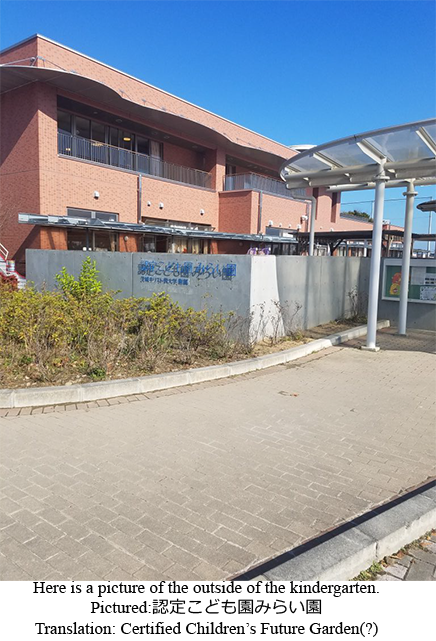 If you are living with a host family in a town other than Omika, from “Ishinazaka” you can walk to Omika Station and catch a train home. Once you put in your ticket information, you can search for available buses. 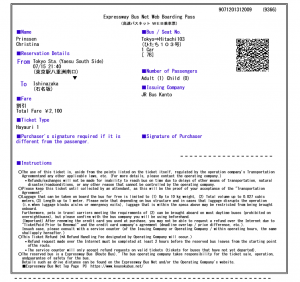 The tickets are displayed from earliest departure to latest. (Be careful! Japan uses a 24-hour clock). Once you find your desired departure time, there will usually be 3 options to chose from. “Hayauri” tickets are early booking seats and are only available if tickets are reserved at least a day in advanced of the trip day. They are a little cheaper at ¥2100 and are what I usually choose when I’m picking tickets. 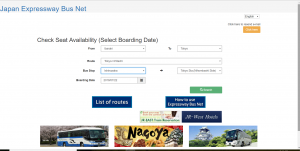 The normal price for a one-way trip is ¥2460 and is the next option. The options in the red boxes are special ladies-only seating if anyone is uncomfortable sitting next to a man. Options or the whole bus may be sold out if you try to reserve late so make sure you get your tickets in advance. Once you have made your selection, the website will have you give your email address and will send you a reservation confirmation and a link for payment. !! !MAKE SURE YOU PAY!!! Your reservation usually has a time limit of 10-30 minutes. If you do not pay within this time limit, the link becomes a dud and the whole process must be started again. I recommend paying right away to avoid any headaches. Once you pay online, they will provide you with a printable electronic ticket. You will need to print it and hand it to the bus driver when you board the bus. After you have had your fun weekend in Tokyo, it is time to return and get ready for Monday morning. Returning buses always leave from Tokyo Station from the Yaesu South Exit. Japanese public transportation is always on time so do NOT be late. I recommend giving yourself plenty of time to navigate the maze that is Tokyo Station. Once you find the buses, it might seem a little intimidating with buses leaving every 10 minutes and masses of people running around. No worries though since you left yourself at least 10 minutes to find what dock your bus will be leaving from….rightttt? They have electronic screens at every docking pillar that lists the next three departing buses. Find the correct departure time and look for 日立駅 (Hitachi Station). If you really can’t find it, try asking one of the station attendants who are wondering around. I am sure they will gladly point you in the right direction. Once you find your bus, there will be 10 minutes of boarding time before you are finally off and on your way back home! The return bus will always stop at Shintanakochi (新田中内), but if you are getting off at Ishinazaka (石名坂 – the next stop), remember to push the button telling the driver that you want to get off. If you don’t, you’ll find yourself at Taga station and will have to find your way back to Omika. Being an intern at IC has allowed me to fully appreciate Japanese public transportation. It is so easy to use and much cheaper than back home. During your time at IC, make sure to utilize it. Enjoy!